Fresh flowers enhance and brighten any office, reception or work space. We can cater for events, or deliver weekly or monthly arrangements for your office, keeping your space fresh and vibrant. Give Vida a call for your personalised quote or visit us in store or you can order online. 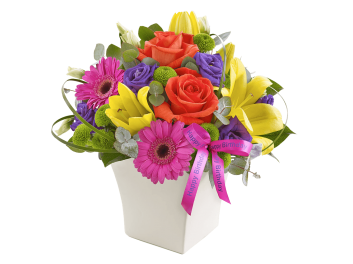 Welcome your visitors with this beautiful arrangement of fresh flowers. ..
Set the tone with this stunningly serious arrangement. ..
Brighten up your Reception area with this arrangement of Tropical flowers.. Warm up your reception area with this beautiful Autumnal display. ..
On those cold winter days why not brighten up the office or reception area with this lovely arrangem..
Delicate mixture of summer flowers to brighten up your office or reception area..